On a four-nation African tour, Prime Minister Narendra Modi is seeking to boost India's economic influence in a region long dominated by rival Asian power China. 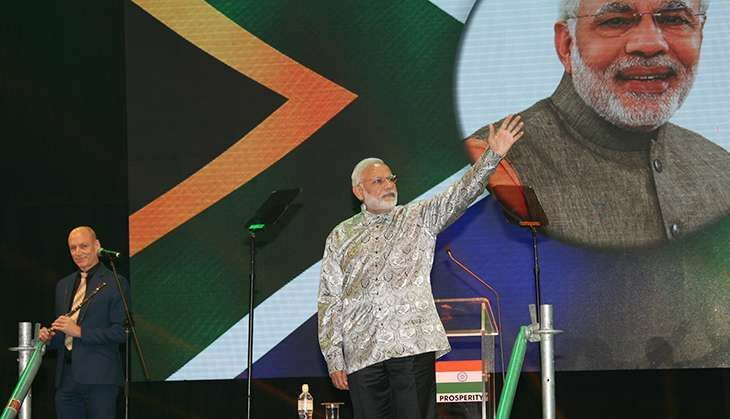 In South Africa on Friday, he was met by jubilant crowds at a Johannesburg concert venue, at an event organised by SA Welcomes Modi, a group representing South Africa's Indian community of 1.3 million people. The event was reminiscent of others, such as the one at Madison Square Garden in New York, with a wide variety of performances showcasing Indian culture. "You are part of the flourishing global Indian family," Modi said as the crowd cheered. "A bond on which we are building the promise of our prosperous future." Wearing a floral 'Madiba shirt', the brightly patterned shirts made famous by Nelson Mandela, he said everything right and whipped the crowd into a frenzy - particularly when he referenced their ancestral and current connection to the Indian sub-continent. His most applauded takeaway was his statement on how South Africa had transformed Mahatma Gandhi. He said Gandhi was as much to South Africa as he was to India, and described the country as Gandhi's 'karmabhoomi'. But not all South Africans have embraced Modi's visit. Several complaints were sent to the Department of International Relations and Co-operation about Modi being invited for an official visit from various organisations. And beyond shiny headlines like "PM Modi Wows the Indian Diaspora in Johannesburg" and brilliant ones like "People just can't get over PM Modi's floral shirt in Johannesburg", there are several opinion pieces about his visit that are so harsh that it would make even Modi's worst critics in India wince. The writers don't shy away from using invectives for him like "fascist", "divisive", "manipulator", "intolerant" and "dishonourable". One went far enough to ask: "How could anyone rally support for a man who is so problematic that he makes (South African President Jacob) Zuma seem like a cute puppy wrapped in a red ribbon on Christmas morning?" "Within India, Narendra Modi is Hindutva's strongman in politics. He is admired by right-wing majoritarian Hindus, and correctly seen as a threat by secularists and minorities. His leadership is marked by authoritarianism, centralisation of power, and absenteeism, leading to an administrative slowdown and paralysis. Overseas, Modi talks of Gandhi and non-violence; within India, he lets his chauvinist followers, including Hindu paramilitary RSS, marginalise, bully, brutalise and even kill secularists, minorities and dissidents. It is not only Indians who are the victims of bigotry and violence in India; Africans are not spared either. If Modi was seriously committed to improving relations with Africa, the first thing he would do is ensure the safety and dignity of African students and visitors in India. In recent times, there have been widely reported incidents of racist attacks, including lynching and public vilification of Africans. Rather than acknowledge and combat racism, the government and its apologists have denied its existence and trivialised it by calling it ordinary criminal behaviour. Jawaharlal Nehru, the first PM of India, was serious about a politics of non-alignment and support for friendship with African states. Interestingly, at the 2015 India-Africa summit, most African leaders referred to Nehru's legacy even as Modi and his ministers sought to erase Nehru's name and unmake his secular legacy. As a vain leader known more for taking selfies in a choreographed politics of spectacle than for any politics of substance, Modi has encouraged an entire industry of symbolic but significant shifts in Indian historical memory. The Nehru jacket is now the Modi jacket, mentions of Nehru are erased from school history books, Nehru's name is dropped from scholarship schemes. Post-apartheid South Africa, with all its problems, offers a ray of hope to developing countries in terms of being strongly committed to building a pluralist, non-racial, non-sexist democratic society. A visit by an authoritarian, anti-secular, anti-minorities Hindu chauvinist PM, without a serious questioning of his unsavoury record, would go against Mandela's legacy." Read more of the article here. "Modi is a fascist with blood on his hands, a fascist who has brought India a poisonous mix of hyper-capitalism and Hindu fundamentalism. For South African Hindus to rush to a stadium to celebrate Modi is a prospect at least as grim as whites rushing to a stadium to celebrate President Trump. Since the announcement that the very dishonourable Prime Minister of India, Narendra Modi, will be visiting South Africa I have been scowling into my beef biriyani. But this morning things got considerably worse. I had the egregious misfortune of stumbling across the South Africa Welcomes Modi website. Two questions came to my mind with particular force: 1. How could anyone rally support for a man who is so problematic that he makes Zuma seem like a cute puppy wrapped in a red ribbon on Christmas morning? 2. Who and what is this so-called South African Indian community? And for anyone with socialist or social-democratic commitments, Modi's hyper-capitalism can only be understood as a brutal attack on any idea of society as a collective project. It has also been a ruthless attack on the environment. The unchecked power of big capital under Modi has led to ruinous social, environmental and economic consequences. In Gujarat, he developed special economic zones that subsidised big business and allowed capital in the hands of few families to flourish as the cost of devastation for minorities, lower classes and castes. Many farmers in Gujarat have been left devastated, as vast tracts of land are non-arable because of the pollution caused by unregulated industry. But as the reactionary nationalists beat their drums for Modi and his fascist politics, those of us who are deeply appalled by Modi and what he stands for, will make it clear that those who choose to fete a violent fascist leader do not do so in our name." "Why is South Africa - where we normally shun the controversial, racist, and violent - so eager to welcome Modi, a dangerous politician once called a "divisive manipulator" by a prominent Indian novelist? South Africans appear to be oblivious of Modi's actions, which include spending a large part of his life in the right-wing Rashtriya Swayamsevak Sangh (RSS) - a group of Hindu fascists who have been called "no different to ISIS" by historians, and whose alumni include Nathuram Godse, the man who killed Mahatma Gandhi. But regardless, a 10 000-strong crowd is expected to welcome Modi next week in Johannesburg, treating him to both Zulu and Indian dancing. The group hosting it, South Africa Welcomes Modi, called the visit a 'very timely one for South Africa', and an interviewee in Durban's Sunday Tribune newspaper a few weeks ago noted that Modi is "widely respected and admired by Indian South Africans", and that he inspires hope for them - god, I really hope not. Modi, it seems, has managed to dupe the world; not only are many not critical of him, but most appear oblivious to his antics. To think such a person will be part of engagements on hate speech in South Africa, and is seen as a hero to South African Indians, is as perplexing as it is worrying." 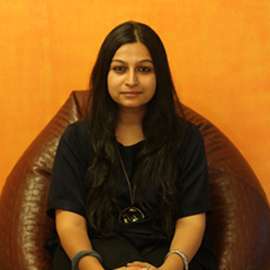 "One would therefore expect that Modi's visit to our country will be greeted with enthusiasm. One gets a sense, though, that a rapturous welcome might not materialise. It could be that South Africans are still haunted by the ghosts of Gujarat. It may be that the shrill cries of the thousands who were killed, maimed, burnt and raped during the 2002 pogrom may still ring in our ears. The deaths, injuries, mayhem and destruction of property that followed the fateful burning on February 27 2002 of the train in Godhra (Gujarat) will remain a bloody blot on India's history. The jury is still out as to whether or not the official organs of the Gujarat state were complicit in those attacks. The undeniable truth, though, is that India's governing elite cannot escape moral culpability for the gross violations of human rights and acts of genocide that occurred in those horrifying three weeks. We have learnt from our own experiences that national healing and social harmony can only begin with an acknowledgment of the atrocities committed and the rendering of a sincere apology to the victims and survivors of atrocities. Through our participation in the struggle for freedom and democracy in South Africa, we have come to accept that our destiny is tied to the future of fellow South Africans. Prime Minister Modi's tryst with President Zuma, important as it may be, will not change the fact that we are South Africans."